Seriously swooning over the cheerful living room below. I adore every little thing about this space and would die if I was ever lucky enough to have such a GORG room in a house of my own one day. That yellow combined with the gold has me squealing with glee and those minty colored walls are perfect for the background, I just can't imagine any other color being so complimentary for the backdrop of this formal room. Even all the little accessories have me weak in the knees. I NEED a chandelier in my life, they are just so stunning. The white rug & white mid century modern couch is just the right touch mixing old with new. This is getting filed in House Loves pronto! Yellow clearly had to be the main focus of this outfit as it was in the room. I paired this stunning dress with some great gold sandals just like the trim on those ridiculous exquisite chairs. The wood heel is almost a perfect match to the wood floors above and a white and gold statement necklace was my idea of bringing some cream colored items into the outfit like the couch and rug above. The minty green DVF clutch has been featured numerous times for a reason, I am obsessed with it. I would have one in every color if it wouldn't make me ridiculously broke. The color is a perfect match to those beautifully painted walls. Finally top off your lady like outfit with some pretty sheer pink gloss that matches the peonies and a spritz of my beloved Calypso fragrances in Mimosa because after all that room is screaming that a sunny drinks is in order! My interpretation of the above room into your wardrobe. Pretty room, love how bright it is! I could def see you sitting in there :) And I so want a chandelier for schy's room - I'm dying to redo in white and pink - with of course, a white chandelier! I need a new house with some more room to play :) aaahhhh I'll keep dreaming. That room is to die for. 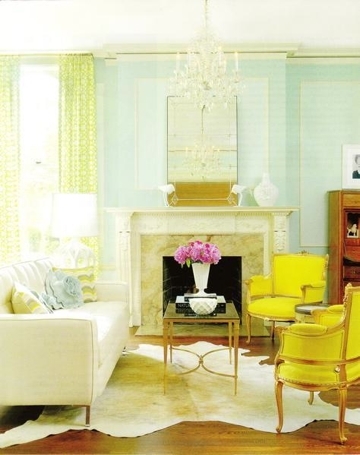 The yellow chairs are gorgeous and I'm in love with the chandelier! I also love the outfit - the yellow dress works perfectly! What a room worthy of inspiration! Just gorgeous! Absolutely LOVE that room and your outfit interpretation!